Of the sixteen species of Nymphalidae found in Britain we have identified eight here at Quoditch. We are probably on our limit unless we spot a "stray". The Nymphalidae are brightly coloured, strong flying. They have four legs, but the front ones are more like bristles (females) or brushes (males) which means that they cannot be used for walking. This butterfly is not particularly common at Quoditch but visits us in July and August. 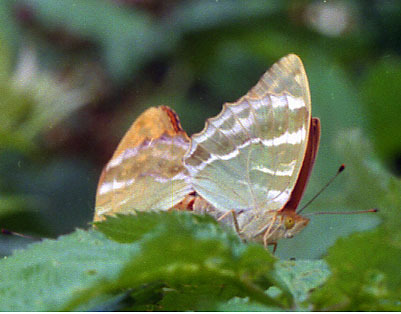 Its underside is quite plain making the butterfly look like a dead leaf. It has a wingspan of about 55mm. 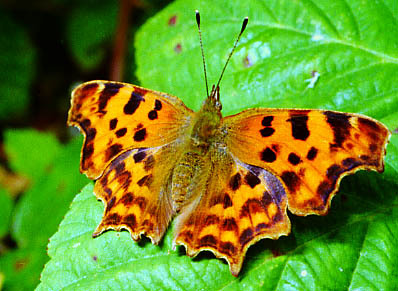 Up until the 1920s this butterfly was restricted to the counties of Hereford, Monmouth and Gloucester. Gradually it has spread and sightings in Devon in the thirties noted the movement from south east to north west across the county. Quoditch probably had its first commas in 1932. This one (found in August 2004) has different markings on it, but we don't know why. The earlier ones are often brighter with paler undersides (var - hutchinsonii) but surely, August would be the later brood? 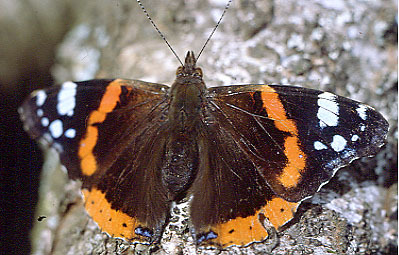 The red admiral is a migratory butterfly, coming from the mainland of Europe each year. 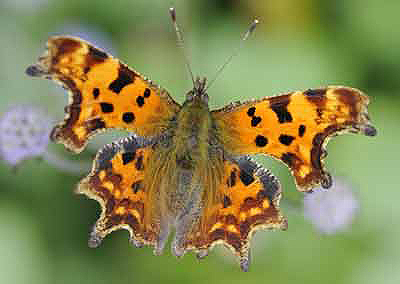 It's quite common in Devon and can often be seen in gardens on Buddleias. 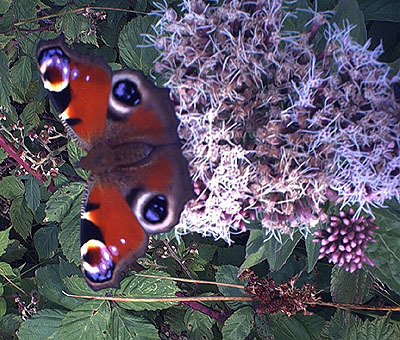 Whilst not one of our more numerous butterflies they are regular visitors to Quoditch. The female is slightly larger than the male having a wingspan of just over 70mm. The larvae feed on nettles. We found this one in June on a very dull day in Field Two. 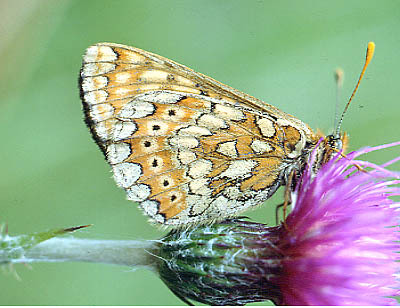 It has a wingspan of about 65mm and appears at Quoditch twice in the season, firstly from May until the end of June and again during August and September. We have seen it at various locations, but it appears to prefer the culm grasses to the woodlands. It very often glides from place to place. 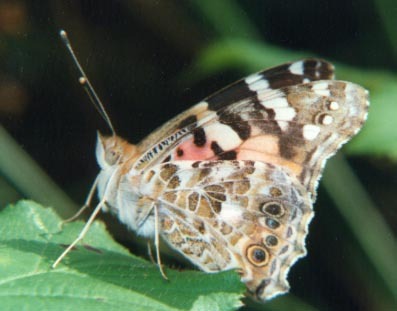 The Painted Lady migrates each year from the Atlas mountains in North Africa. In 1996 and, again, in 2009 there was a major influx and waves of them could be seen flying in a roughly northerly direction. Their descendants will fly back to Africa in the Autumn. This one was found in September 2003. 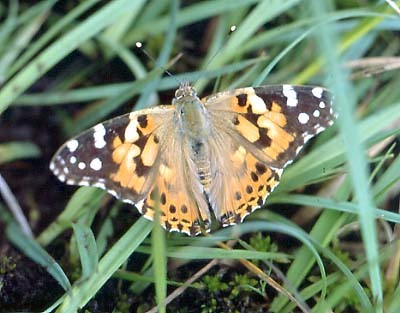 The painted Lady migrates from North Africa in May and June. Generally it cannot survive the British winters. It can be found all over the world with the exception of South America. A pretty but nowadays not so common butterfly. It has a wingspan of about 50 to 55mm, the female being larger than the male. As the Latin name implies the larvae feed on nettles and often you can see the webs with the caterpillars on nettle leaves. At last, we've managed to photograph a Peacock. These are very wary of any movement near them and, in our experience, usually fly off as soon as they hear you. Each time we approached this one through the long grass it flew off, so we trimmed the grass down. Next time it was on this plant it didn't hear our approach. Even so this was taken using an auto focus digital camera rather than a "proper" one. This butterfly likes the nectar from Hemp Agrimony (it also likes buddlia in suburban gardens), whilst its larvae enjoy our nettles. 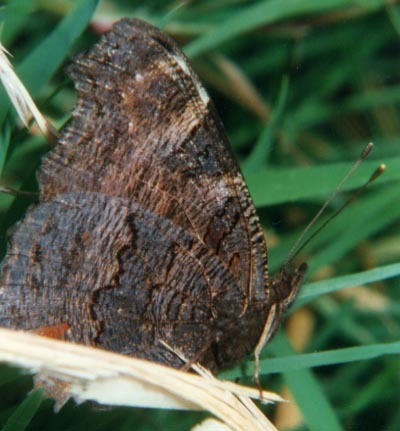 The peacock hibernates overwinter as a butterfly in piles of logs or hollow trees. Sometimes, as with this one, you can find them in your garden shed. They can be found all year round with the exception of June and early July and have a wing span of just over 60mm. The various fritillary butterflies are all spectacular to see and we are lucky enough to have found four different ones so far. 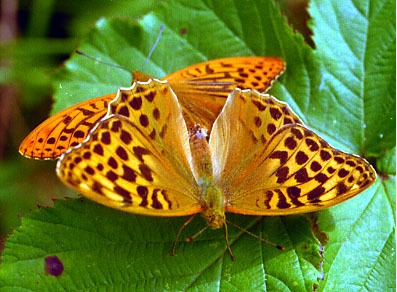 Fritillaries are members of the sub family the Argynnidi and were supposedly given their name because of their resemblance to the patterns on Fritillary flowers. The word,"fritillaria", comes from the Latin name for a checker board. Dog Violet (viola canina) is an important larval food source for the fritillaries and, thankfully, we have a plentiful supply at Quoditch. 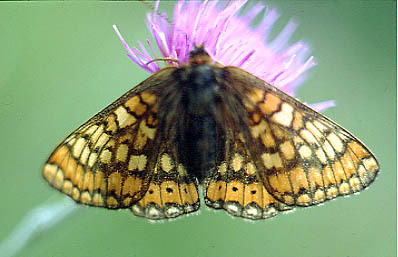 At one time known as the Greasy Fritillary the Marsh Fritillary is a very special butterfly. Quoditch must be preserved because of its presence even if there were no other reason. This butterfly is on the endangered list and, according to some forecasts, could be extinct by the year 2020. It is a beautiful butterfly and is very easy to observe. It is quite inactive and will allow you to approach it. It rarely flies more than a few feet above the ground and then not for very far. Here is a side view showing its beautiful underside. The larvae feed on Devil's Bit Scabious (Succissa pratensis) which we have in most of our areas. They can be seen in their webs (hibernaculae) woven around the scabious leaves. They have now extended their colonies to two of our fields. This male, taken in May 2004 is a lot darker. The black at the rear of the wings is wider. 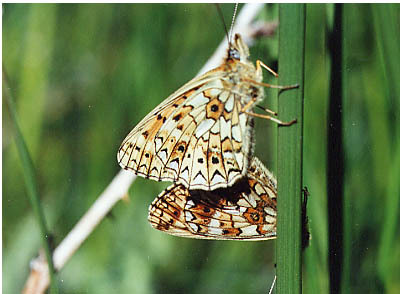 Sadly we have not seen our Marsh Fritillaries since June 2006 - so it looks as though that is another colony gone. 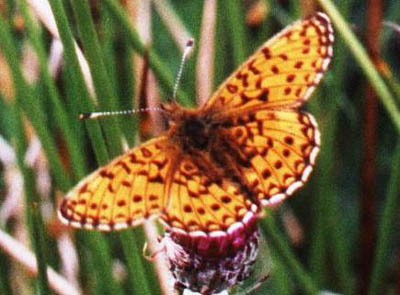 These can be easily confused with the slightly larger Pearl Bordered Fritillary. We see them (mainly in Field Four) during June and early July. The male is slightly larger than the female having a wingspan of about 44mm. Here's a side view taken in June 2001. These are quite common on our land in July and August and can also be seen in adjoining fields. They particularly like Brambles, so we keep bramble banks especially for them. The male is the nearer of the two. They can be distinguished not only by their size but also by the patterning of the underside of their wings which are a pale khaki green in colour. 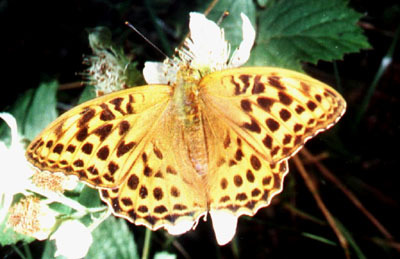 The silver washed fritillary lays its eggs on moss about one and a half to two metres above ground level. When the caterpillars hatch they first eat their egg shells, then they hibernate for several months until the following April. At that time they slowly make their way onto the ground to find their food plant, Dog Violet. The silver washed has a wingspan of up to 75mm, the male being slightly larger than the female.